Gator Board is a hard mounting medium for pictures and posters. It is made of polystyrene, bonded on both the back and front sides, giving it more strength than lighter-weight foam core backings. Gator Board is available in either black or white, with thicknesses between 1/4-inch and two inches. The bonded backing on Gator Board makes it somewhat more difficult to hang than foam core, as the spikes on some types of mounting brackets can't penetrate it. There are, however, numerous ways of hanging a Gator Board. Attach mounting hardware to the Gator Board. This could be a hook-and-loop strip attached with double-sided tape if the board is relatively small or a Z-Clip, which is one-half of an interlocking metal piece whose other half attaches to the wall. The Z-clip needs to be attached to the back of the Gator Board by screws. 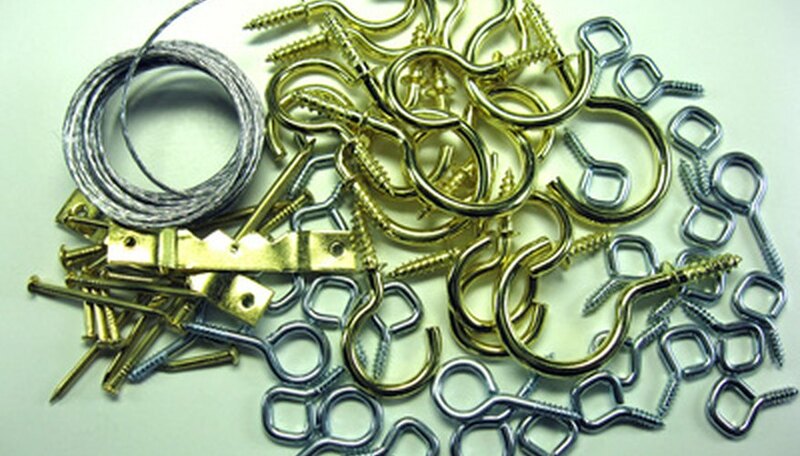 Screws can also be used to attach metal loops that hang over nails in the wall, or brackets to hold picture wire. Some hanger clips can also be glued in place with white glue or epoxy. Mark the spot on the wall for your Gator Board to hang. Remember that the height you mark on the wall will be the height of the attachment hardware, not the height of the top of the picture. Check whether there is a wall stud where you need to hang the picture. You can use an electronic stud finder that will beep when it passes over a stud, or just knock on the wall and listen for the places that sound less hollow. Drill a hole in the wall and hammer in a plastic drywall anchor if the site for a screw or hook is not over a stud. If it is over a stud, you can screw a hook or screw directly into the wood. If you are using a hook-and-loop mounting strip, you won't need to drill at all; just use double-sided tape attach a strip of loops to match the strip of hooks glued onto the back of the Gator Board. Press the Gator Board up against the wall, slightly above its resting position. Let it slide down until the Z-clip catches on the clip screwed into the wall, or the picture wire catches on the hooks screwed into the wall. If you are using hook-and-loop strips to attach the Gator Board, just press it up against the wall. The strips will grip it as you do so.